Developers plan to extend part of the Bluewater shopping centre to add an exhibition and events venue, creating more than 1,000 jobs. The two-storey extension would fit "seamlessly" onto the Water Circus at the centre in Dartford, Kent. 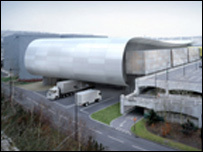 Construction of the 5,200 sq m venue is expected to begin next summer and it should be completed in late 2008. Dartford Borough Council has granted deferred approval to the project, subject to legal agreements. Peter Allwood, from developers Lend Lease, said: "An events venue within a retail destination is a first in the UK. "It will bring a whole new dimension to Bluewater, bringing events that would normally require travel into central London." He claimed the development could generate more than 1,000 additional jobs for local people.